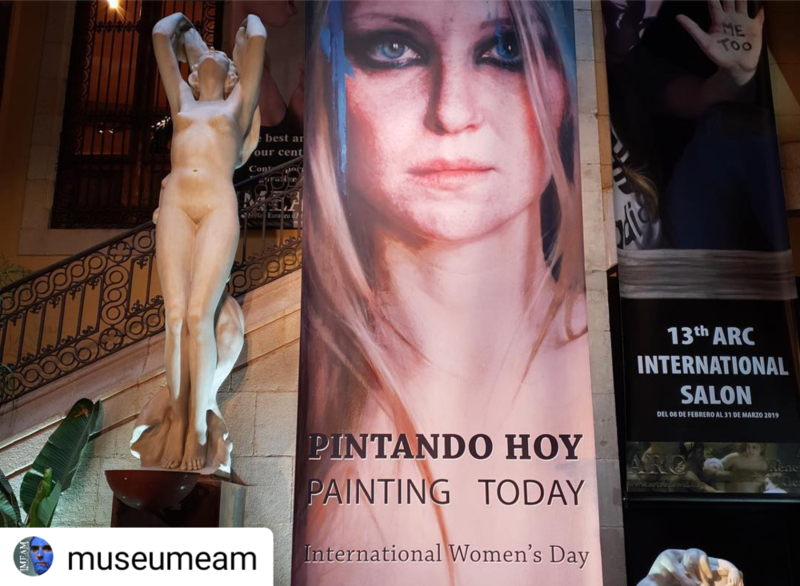 On International Women’s Day, observed on March 8th 2019, the European Museum of Modern Art—better known as the MEAM—inaugurated the exhibition Painting Today / Pintando Hoy curated by PoetsArtists publisher Didi Menendez. Painting Today shows over 70 artworks by female artists of many different ethnic origins, hailing from north, south, and central America, Oceania, and Europe. Some are emerging artists, others have reached the pinnacle of their careers. Nineteen of us were lucky enough to have the time and means to travel to Barcelona to go to the well-attended opening ceremony at this beautiful and important museum, founded by its director, José Manuel Infiesta—a true gentleman, an indefatigable visionary, a lover of strong figurative art. It isn’t easy to launch a museum in Europe. As opposed to American standards where virtually anyone with a spare room can set up a museum, here in Europe the rules and regulations are quite strenuous and complicated. 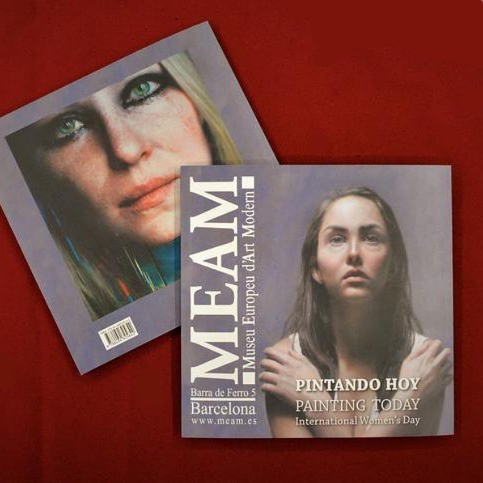 Moreover, the MEAM is the only museum in Europe that shows contemporary figurative art exclusively, so to exhibit work here is an extraordinary privilege. This is not the first time the MEAM holds a women-only exhibition. 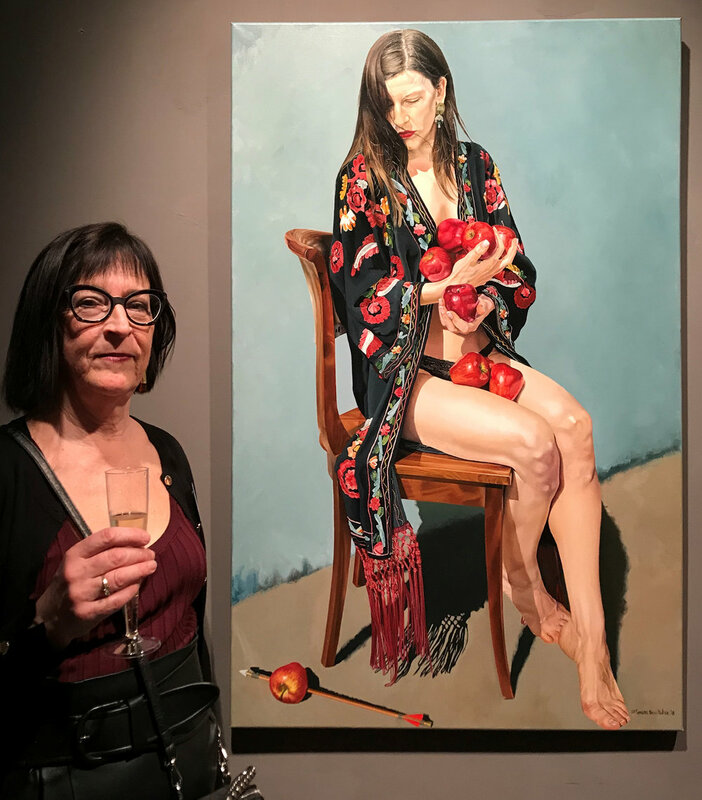 Last year, in celebration of the 2018 International Women’s Day, the exhibition Mujeres Artistas Hoy presented contemporary figurative artwork by outstanding Spanish female artists. 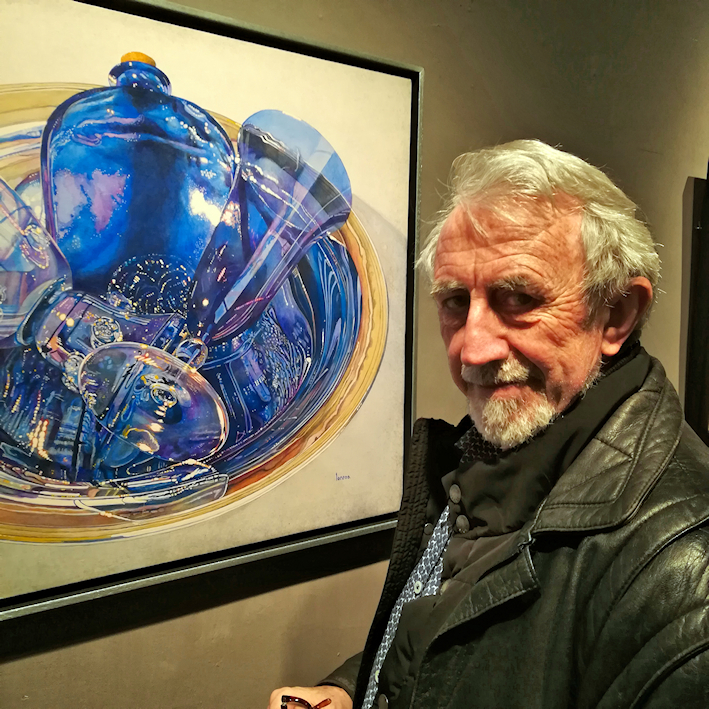 Infiesta is a pioneer who champions figurative skill-based art in a world where the myopic marketing of abstract and modernistic art by governing tastemakers and art speculators still exerts much influence. Infiesta actively supports figurative artists—young and old, all genders, from all countries and cultures. Many of us dream of showing at the MEAM and hope our work will one day join its permanent collection. Despite Painting Today being a women-only exhibition, its title is not indicative of gender. This serves to highlight female artists’ struggles to break glass ceilings in an artworld in which male artists still get a disproportionally large ratio of available opportunities. Having a non-gender-based title sets the stage for a future in which gender isn’t part of the classification, value, or status of the artist any longer. There’s not only a great chasm in opportunities to exhibit and sell for female artists, but increasingly there’s a backlash coming from mostly white, often older males who cannot understand what the fuss is about. Some even ask why women-only exhibitions are held at all, as if this has not been the norm for men for centuries. These critics are seemingly completely oblivious that today’s ratio in group exhibitions is far from close to equal. I see that as a grave lack of empathy and understanding. Sadly, for many who are accustomed to privilege, equality feels like oppression. Mind you, I’m not arguing in favor of gender balance as a rule where exactly 50% needs to be female. No! But just give us an opportunity to show that our work is competitive—if need be by removing artists’ names from juries and curators—so that we can compete on an equal footing. If you’re still thinking women exaggerate about inequality in the arts, get the facts HERE. This inequity that the majority of women artists experience must be even worse in countries where society hasn’t reached the slow-growing awareness of the western world yet. When artists get together, we talk about our isolation, the pervasive misogyny, the ageism, the patronizing mind games that often hurt so badly that creativity is crushed, and the juggling of creative work with household obligations. How many of the nineteen women who attended the exhibition opening of Painting Today do you suppose went back home without an urgent to-do list, having ample time to reminisce at leisure about this grand opening that placed us on a red carpet, under bright spotlights? 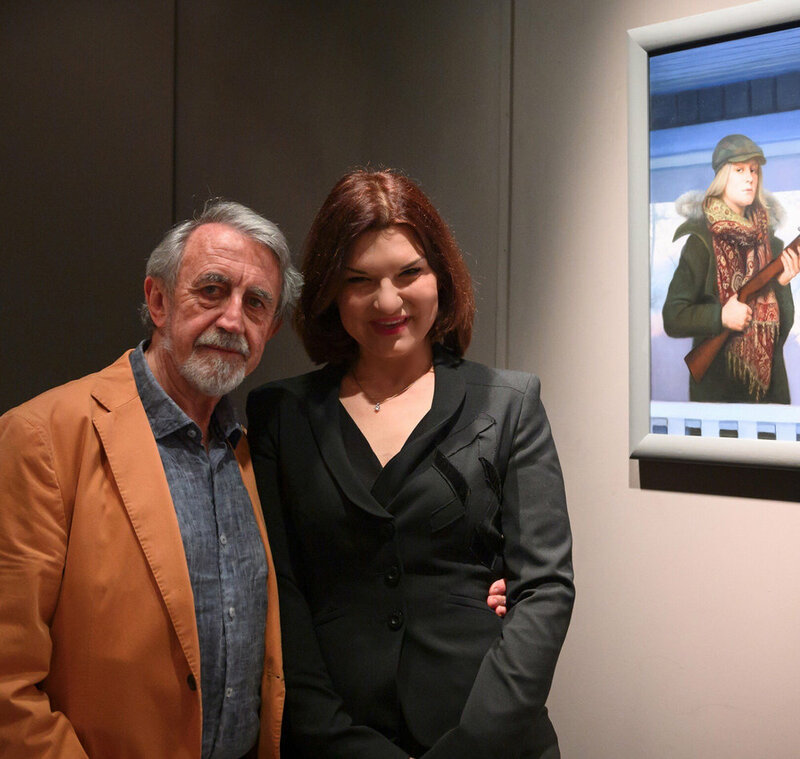 We certainly need more visionaries like José Manual Infiesta, who gives us the opportunity to exhibit in such a magnificent and distinguished museum—he appreciates artists and it shows. His devoted team of young dedicated assistants made us feel welcome, efficiently tending to our needs with ready smiles and encouraging can-do attitudes brimming with positive energy. A delightful contrast to the stuffy self-important attitude we so often find at other art institutions. The opening night was glorious! The director, museum staff, the press, and throng of attendees made all of us feel special—from the red-carpet photoshoot in the grand entrance hall, the photographers, and the beautiful banners, to the striking display of our paintings, the warm inclusion of all attending artists, and the copious flowing cava. The curator, Didi Menendez, was unable to attend the opening so she asked me to speak on her behalf which was a great honor for me. See my opening speech HERE! Thanks to the PR organized by the museum, the press coverage in local and national newspapers, radio, and television was impressive. See more paintings, photos, and lots of press articles HERE! Social media flooded with images of the event and many of the attending artists described this event as a highlight in their career. Teresa Brutcher posted the following words on Facebook that are worth repeating because they sum up what we all felt during the events surrounding Painting Today. Yes, throw a group of female artists together and you’ll mostly find love, friendship, support, and an atmosphere that increases a sense of well-being and energy. While there’s healthy competition, there’s also a generosity to help and support, to exchange ideas and suggestions—and lots of hugs! How wonderful it would be to see a repeat of female artists’ exhibitions at the MEAM on an annual or biannual basis. Variation could be added by changing the premise, making adjustments to the curatorial process, selecting a specific subject matter, or by focusing on figurative artists from specific regions, especially those that have even less opportunities than we westerners do. 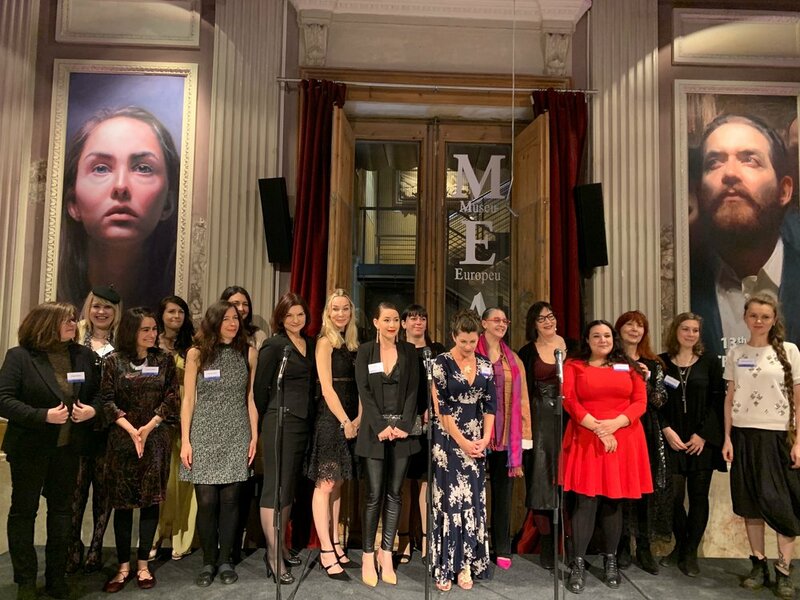 The MEAM will truly have a huge impact on the artworld and society by continuing to celebrate International Women’s Day by tipping the scales slightly in our favor by giving female artists the opportunity to show our very best work. This opening at the MEAM was a highpoint in my artistic life, competing with the unveiling ceremonies of my public statues and my first solo exhibition a long time ago. My heartfelt gratitude goes out to everybody who made this evening possible and oh so very fabulous! Next best option to view the exhibition is to buy the catalog HERE! Catalog of the exhibition Painting Today, International Women's Day of the European Museum of Modern Art (MEAM). Total of 96 pages, introduction by Didi Menendez, and biographies of the exhibiting artists, €9.